A lack of internet, power, and time has conspired to get me way behind on my blogging. There is a heap of activity to recount. 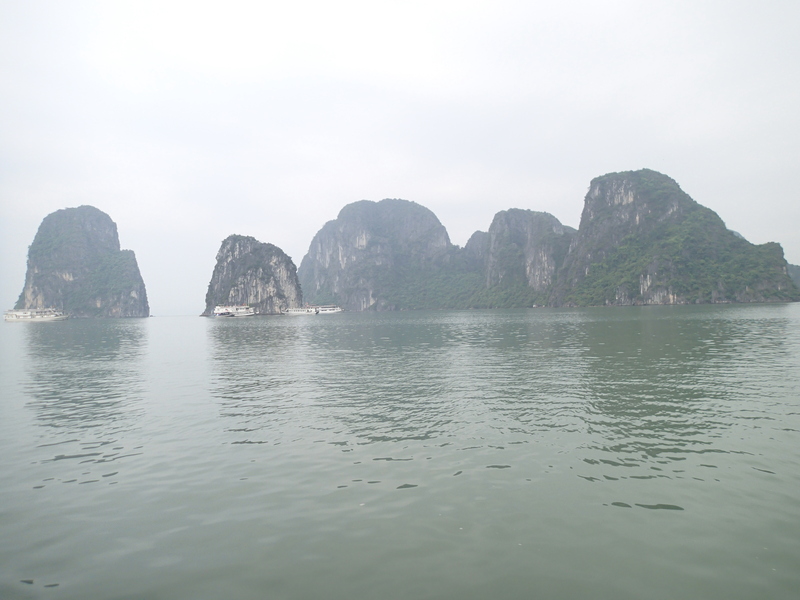 Last week we went out to Halong Bay. A UNESCO World Heritage Site, it is one of the more awe inspiring places I’ve ever been. Imagine Norwegian fjords surrounded by crystalline blue waters. It is the cliff of every Bedford limestone quarry chopped into 1969 islands and speckled with jungles. It was both home and a surreal land wrapped into one place. 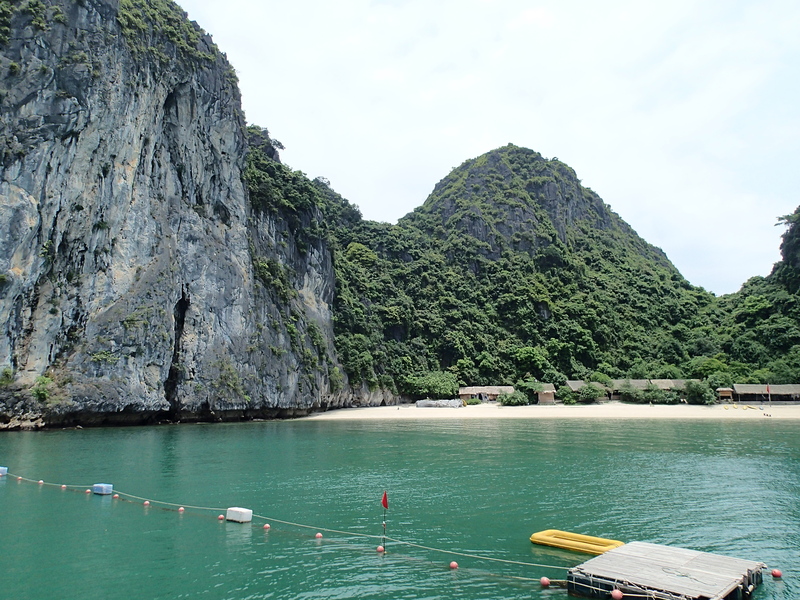 We took a 4 hour bus ride from Hanoi to Halong Bay, which was…intriguing to say the least. The theme of Vietnam being a hodgepodge of old/new, rich/poor, Eastern/Western continued. Most of the drive was a trek through vivid green rice paddies. Upon close examination though, one sees graves interspersed throughout the watery fields. When I say graves, I’m not talking a mere headstone, I’m talking full up marble sarcophagi sporadically placed throughout otherwise virgin fields. I haven’t pinned any locals down on the “Why?” yet, but it is a fascinating wrinkle in a place wrinkly as a slept-upon bedsheet. 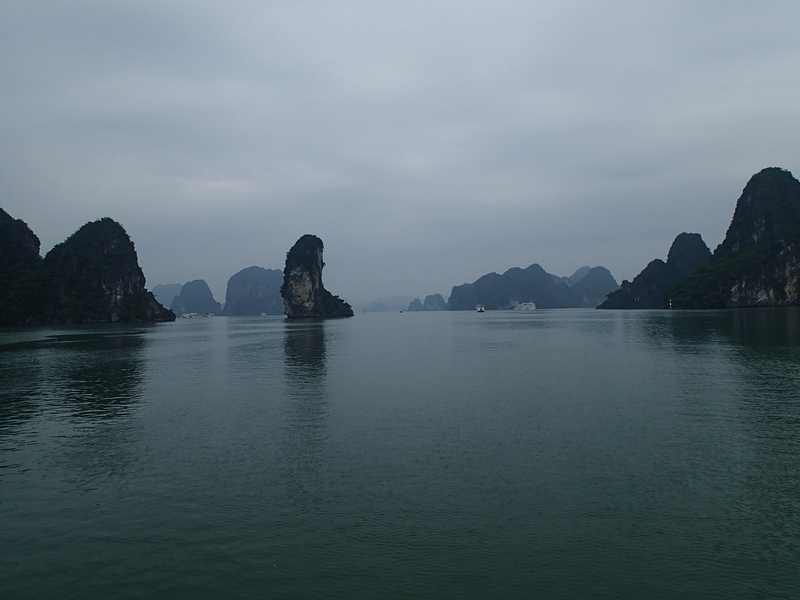 Upon arriving in Halong Bay, we stood at the quai for about 15 minutes before embarking on the boat. Much to my delight and surprise, I started hearing my name be called out through the din of the crowd. Suddenly Mark Schneider, a giant of a friend from home started wading through the masses to where I stood. 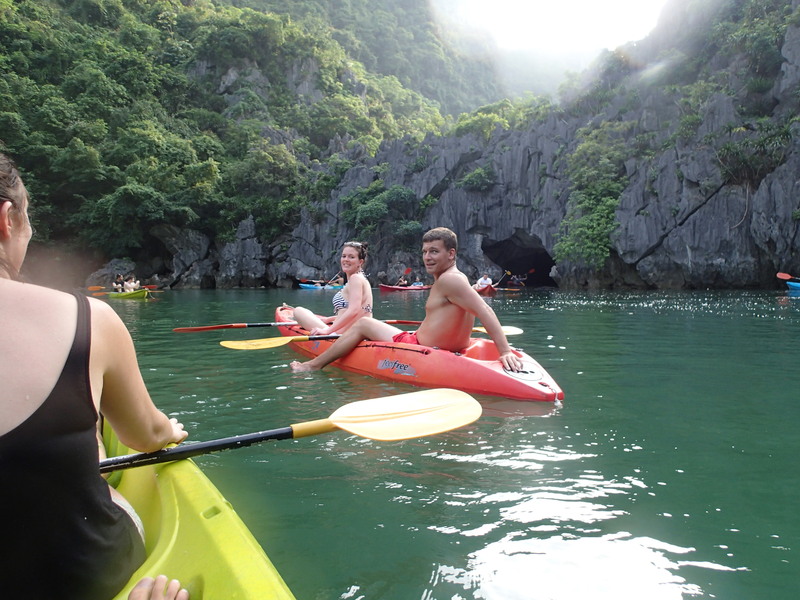 Mark and I knew that we were going to both be in Halong Bay, but the fact that I was getting on a boat, and would only be on the mainland for a few minutes, coupled with the lack of cell phones for either of us made meeting up an improbability to say the least. Ah, we lucky Hoosiers. An accent recognizable anywhere. I figured the chances of two native Bedfordians being in the same spot in Vietnam independently of one another were far less than one in a million. 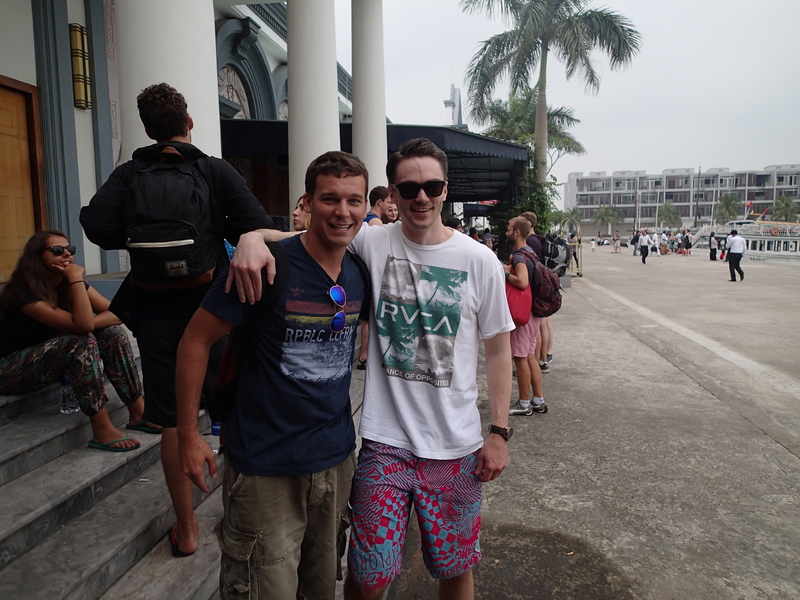 It was a poignant moment for me, to see a guy I’d grown up with for years and years in a place so far from home. Standing next to 3 Australians diminished it somewhat, as those people travel like mad and run across one another in countries both near and far, but to understand where Mark and I came from, a place where Vietnam is a nightmare to be forgotten, not a sliver of earth to be seen, really put the whole trip into a more focused perspective. It was a meaningful hug between two men an awfully long way from home. Upon embarking on the boat, we quickly realized that we were in for a treat. Our Kiwi guide Jack was “on” from the moment the tinder pulled away. The junk was owned by a woman affectionately known as “Mama” who lives and operates the boat 19 out of every 21 days. She has an incredibly profitable enterprise, between renting rooms on the boat and selling what we’ll politely call “liquor of dubious strength.” She plays her part to a T though, smiling and laughing through whatever nonsense this crew of backpackers gets themselves into. She employs 7 family members, all of whom sleep on mattresses on the back of the junk including Mama’s 7 year old granddaughter Hai, who looked at our crew suspiciously through her cutting dark eyes. Many Westerners would consider this living arrangement barbaric, but as is always the theme in Vietnam, everyone seems quite happy with their lot in life. Again, it puts into perspective what one really needs in life. This is a family that eats every meal together in a place as majestic as I have ever encountered. Sleeping nightly under the stars seems a small price to pay. Once we arrived on Castaway Island, we were greeted to “rustic” living facilities. Our huts were placed mere meters from the beach, and as I woke up, huddled under my mosquito net with the sun glaring off the white sands I considered how far I’d come. Gone was the 5:15 wakeup in a -15 degree Chicago. I was seeing the world and taking what it had to give. That’s what I came for. 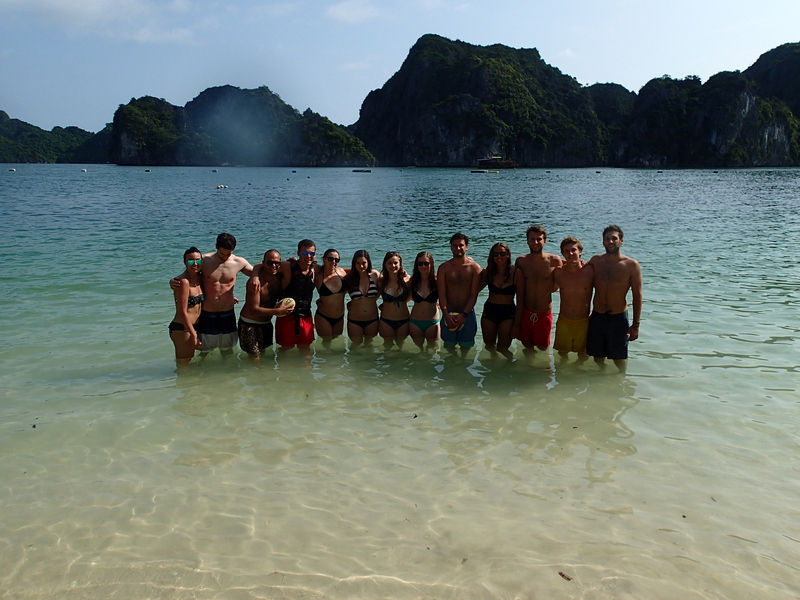 We climbed and kayaked, ate and drank, and shared stories under the stars on the edge of the beach. Our crew of about 20 was made up of Scottish, German, English, Spanish, Bulgarian, Australian, Vietnamese and 2 Americans besides myself. With a group that diverse, there are constantly new viewpoints and experiences to be discussed. Through my travels, I’ve gotten a chance to discuss Scottish independence, the situation with Ukraine, German thoughts on the Euro, the impending World Cup disaster (the Braziallian’s words), and the viticulture of New Zealand. These weren’t articles read on an iPad on the way to work. They were real conversations with people who LIVE the realities of different situations. Boots on the ground, no profit motive or pretensions, timely and candid. Being the former trader, I always want to put a price on this kind of interaction but it isn’t possible. These are experiences that can’t be bought and sold like a newspaper at the bodega. The world becomes smaller but more intricate with each passing day on the road. And so the conquest continues. 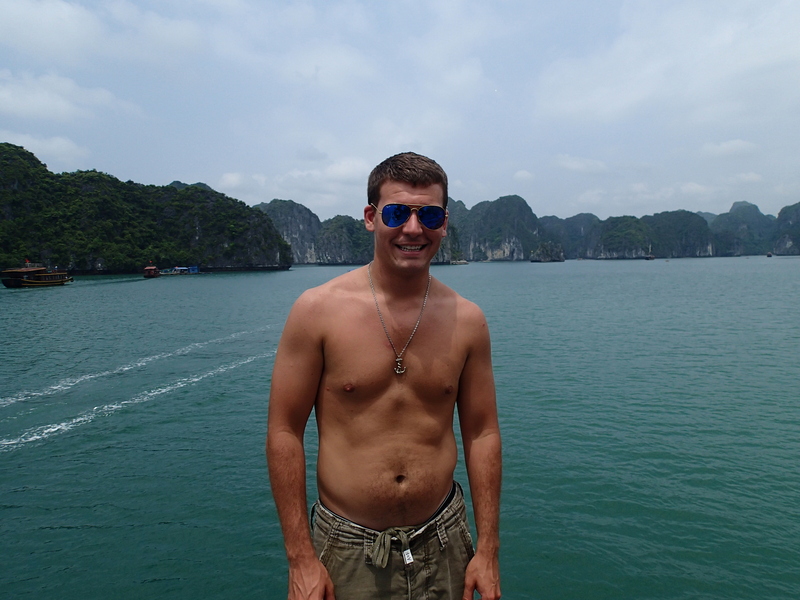 It was great to have a run-in with a friend as old as Mark bookended by an experience like Halong Bay. It puts into clearer perspective how unique it is for the two of us to have interactions with people from all across the world. It makes me appreciate the Conquest even more.